WASHINGTON — Cash will no longer be king on one of D.C.’s popular limited-stop bus routes, and cash payments could soon be banned on other routes as well. Metro is set to ban cash payments on the 79 limited-stop route along Georgia Avenue, between the Silver Spring Transit Center and Archives-Navy Memorial, starting June 24. It’s part of a pilot program meant to speed up bus trips that is drawing some concerns from riders. The ban would formally become permanent in December after a public hearing later this year and could also expand to other routes. Loading cash onto a SmarTrip card on the bus can take at least 10 seconds per person, which can significantly slow the buses down when buses sit longer at each stop waiting for riders to board. 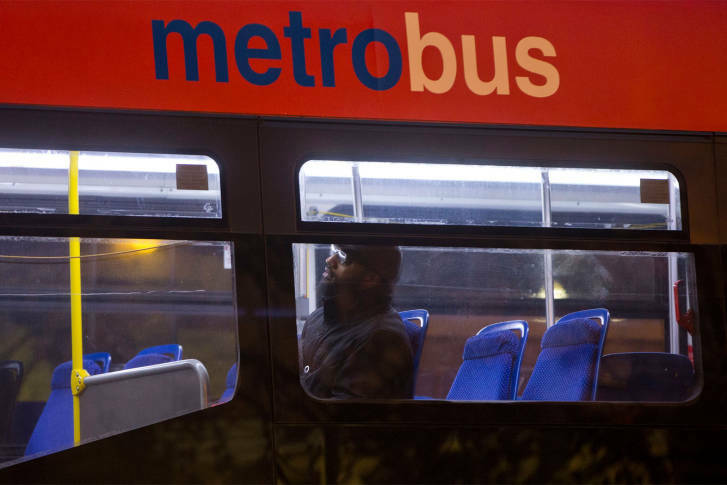 “Travel time is a significant influence on ridership, and the slower fare payment transactions may discourage potential riders from choosing Metrobus,” Metro staff wrote to the Metro Board. Last Thursday, the board approved the pilot cash-free program and a public hearing in late summer or early fall on making it permanent. Metro no longer allows riders to board any bus with less than the full fare already loaded onto their cards. The cash-free payment rules are not the same as off-board fare payment being used in other cities which have riders pay at the stop instead of while boarding, but Metro General Manager Paul Wiedefeld believes cash-free and similar improvements could be important as Metro finalizes a broader bus system overhaul that is being overseen directly by top Metro leaders. “It is something that’s a trend within the industry, but we want to see how that plays out here in our community,” Wiedfeld said of the ban on cash payments. In other cities, those bus system overhauls have also included dedicated bus lanes. Metro has no authority on its own to implement those here without significant effort from local and state departments of transportation. Some steps are underway to expand bus lanes in the District, and Montgomery County plans some limited bus lanes on the shoulder of U.S. 29 near Burtonsville. The cash-free program could be extended to other limited stop routes across the region as soon as this fall, including Metroway in Arlington and Alexandria, REX Richmond Highway Express in Fairfax County, the K-9 and J9 New Hampshire Avenue and College Park-Bethesda routes in Montgomery and Prince George’s counties, and other limited-stop or express routes across the region. The cash ban is raising some concerns from riders and Metro Board members. “Cash-free buses are something we have always worried about for the disability community and the underserved community, because there is a group that doesn’t have access to anything but cash — do not have credit cards, do not have bank accounts, do not have checking accounts,” Metro Accessibility Advisory Committee Chair Phil Posner told the Metro Board. About 3 percent of riders — 200 people each day — use cash just on Route 79, Metro said, while another 6 percent of riders add value to their SmarTrip cards. “The 79 express makes 16 stops … the alternate route, the 70, makes 49 stops,” Posner said. He asked the Metro Board to consider only barring people from adding money to their SmarTrip cards on buses rather than banning cash payments by those who simply slide two $1 bills into the farebox. “Make a decision that has a little heart to it for the people, the large population, that doesn’t have it, because this is a pilot that’s going to affect everything from Columbia Pike throughout the entire system, and I think that’s really important to take into account,” Posner said. Metro has not set a clear policy for what would happen when this program begins if someone boards the bus and only has cash or has a SmarTrip card with less than the required fare. Wiedefeld said it would be dealt with by bus operators on a case-by-case basis. They have typically been instructed to avoid confrontations over fares, since those can sometimes develop into attacks by riders. “Let’s see what the experiment shows, but we obviously have problems not just on bus but on rail with individuals entering the system and not paying. So let’s see what happens on the bus side and see if, on balance, this produces more benefits in terms of shorter stops at bus stops and a shorter ride for our passengers than … whatever revenue might be lost by allowing a few riders to travel for free,” Maryland Metro Board Member Michael Goldman said. Riders who want to follow the rules could add money to their SmarTrip cards at Metrorail stations or at certain grocery stores and pharmacies like CVS. Metro and CVS averted a potential end to their agreement this month with promises of better responsiveness to problem SmarTrip card machines among other things. “It’s a pilot. That’s what we want to do, we want to figure out some of those issues as we do the pilot,” Wiedfeld said. Metro has also now added an option at all rail station SmarTrip card fare machines to buy the popular seven-day regional bus pass. The $17.50 bus pass saves riders money who take the bus at least nine times per week. “We are committed to meeting the needs of our diverse ridership,” Wiedefeld said.